Arthritis is a very common problem in cats and dogs. It usually occurs as they get older, but it can also occur in certain predisposed younger animals too. Larger breeds of dog are more susceptible than smaller breeds. There is no known cause for primary arthritis, but secondary arthritis can develop due to abnormal development of certain joints (for example hip or elbow dysplasia), trauma to the joints, or extra stress on joints – most commonly due to obesity. Arthritis is a painful disease. Common signs that your pet may be experiencing joint pain could include limping, reluctance to exercise, hesitating or difficulty jumping, difficulty with stairs, tiring more quickly on walks, licking painful joints and sleeping more. Sometimes these signs can be quite subtle. It can be helpful to assess your pet for ‘absent behaviours’… i.e. things they always used to do, for example; greet you at the front door enthusiastically when you arrive home, that perhaps they now seem to do less of. These signs can be easier to spot in dogs as we watch them walking daily, but cats also suffer from arthritis. If you think your pet is arthritic then speak to one of our vets and ask them to check your pet’s joints. Arthritis is diagnosed via a complete physical examination and x-rays to identify the cause so the treatment can target the right place. Although there is no cure for arthritis and the wear and tear cannot be reversed, the condition can be managed to slow down its progress, allowing your pet to still enjoy a good quality of life. There are lots of treatment options available. The main aim of treatment is to provide pain relief – arthritis is painful as the joints are inflamed and the cartilage that prevents bone grinding on bone wears down. The most commonly prescribed drugs for arthritis are Non Steroidal Anti Inflammatory Drugs (NSAIDs), which come in a variety of formulations including liquids, tablets and injections. Other pain-killers may also be used alongside NSAIDs to control your pet’s discomfort adequately. Supplements and prescription diets are also available which help promote joint health. In overweight pets, weight loss is crucial as extra weight will put more strain on the joints, so controlling your pet’s weight can hugely improve comfort levels. This isn’t always easy in pets whose mobility is limited, but the vets and vet nurses will be able to help you with this. beneficial than swimming in a cold river or lake. Swimming is a great non-weight bearing exercise. It not only improves muscle strength and the range of movement of the joints without the impact of normal exercise, but it is an excellent cardio workout for your dog so can also help with weight loss in overweight, arthritic dogs. Acupuncture can be performed by a qualified veterinary acupuncturist – where small needles are places in the skin and muscle, causing the release of endorphin hormones which naturally relieve pain. Physiotherapy often involves massage and exercises to restore the function and movement of the joint to reduce pain. Laser therapy includes the application of non-ionizing light to the affected joints / damaged surrounding tissue. This triggers a special cellular response that ultimately leads to a reduction in inflammation and pain . With regards to exercise you should aim for regular but gentle exercise – shorter more frequent walks are better than fewer, longer walks. – for cats, providing litter trays with lower edges for easier access. 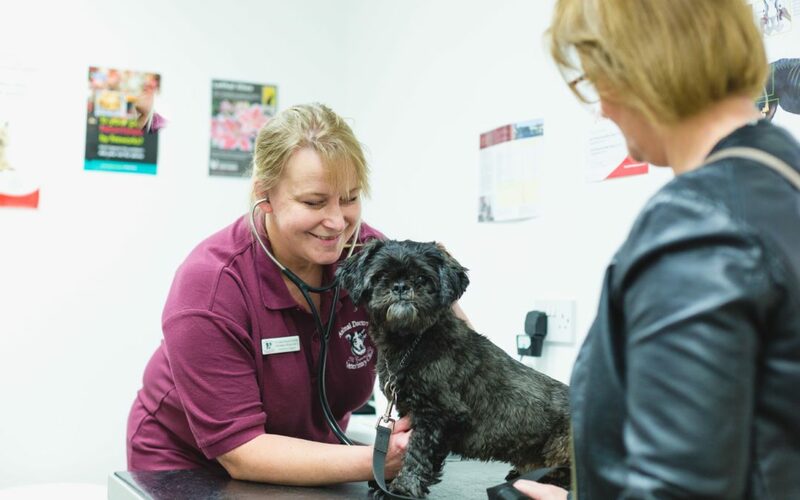 If you think your pet may be stiffening up, don’t just assume it’s old age – get them checked out by one of our vets and see what we can do to help!